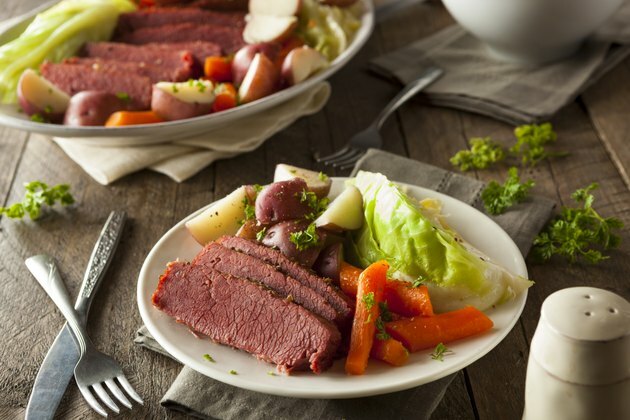 Corned beef, a salt-cured, seasoned beef brisket, is a favorite in Irish-American culture. Thinly sliced corned beef makes an excellent sandwich filling. It also works well in a potato hash. Corned beef is extremely high in fat and sodium, so save it for special occasions. Corned beef is relatively low-calorie but very high in fat. A 100-gram serving has 251 calories. The total fat content is 18.98 grams, which is more than a quarter of your recommended daily value. Because of the way in which it is prepared, corned beef is necessarily high in sodium. A 100-gram serving contains a whopping 973 milligrams, which constitutes 41 percent of your daily recommended value. At 18.2 grams per 100-gram serving, corned beef is a good source of protein. It also contains 10 percent of your daily recommended value for iron. The quantities of other nutrients in corned beef are negligible.